Back of the Cereal Box: Honk Honk! This Baby Swallowed a Penny! 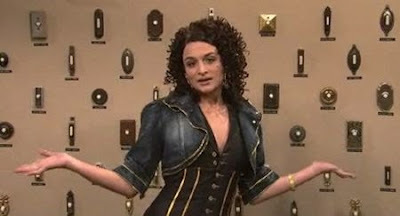 As I’ve said before, I enjoy Jenny Slate’s SNL character Tina Tina Shanooz, enthusiastic business woman of indeterminate ethnicity. Looking at Slate’s Wikipedia page, I noticed that the character’s last name is spelled Cheneuse, like how you’d spell entrepreneuse (if you’re the kind of person who uses that word a lot) or masseuse (if you’re particular about who rubs you). And the character is an entrepreneuse. I don’t know why I assumed the name would have been Shanooz, now that I think about it, and for all I know the spelling on the Wikipedia page could have been put there by Slate herself. (Because being on Saturday Night Live gives you so much free time, of course.) And SNL Transcripts has it both as Cheneuse and Shanhouse. Regardless, searching my spelling prompts Google to suggest Shanoose, which gets the most hits of all. So who cares? I mean, I already have thought more about this than I need to. But I think this little implications beyond a sketch that airs at the end of SNL. I think it’s weird how something that’s never written down in any official form becomes so subject to interpretation — that today, when word-based information is plentiful and immediate, we can still be no better off than when English didn’t have standardized spelling (standerdyezd spellink). In this case, no one’s guess seems any more likely than another. What’s the best guess? Just assume that the one with the most Google hits is right?